In today’s environment, the user landscape is much more demanding than ten years ago. Most workers, while having an office computer, also are mobile workers, wanting the ability to access files and complete work while they’re on the road or out of the office. Because of this, companies have had to implement new technologies to allow for secure access for mobile devices. 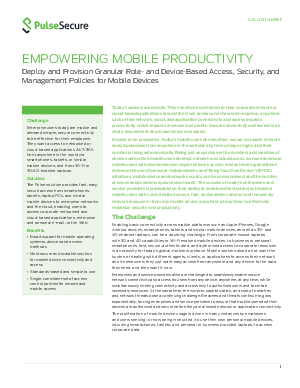 Download this whitepaper to learn how to properly empower your organization for mobile productivity and see how you can deploy and provision for this device-based access with improved security and management policies.